Now, imagine the simulator wants to simulate the real world’s view in the ideal world. In order to simulate $x$ (honest party’s input), the simulator must send $1$ to the trusted party and then receives $x$ from it. Thus the simulator succeeded to simulate $X$, but now the simulator computes the output as $X$ && $(Y = 1)$ = $X$, which is not the equal of the output in the real view $X$ && $0$ = $0$. Thus the simulator cannot simulate the output in the ideal model. The definition says that for every adversary A for the real model must exist a simulator S for the ideal model. Considering this definition, I could find an adversary (who sends $y = 0$ in the real world) that there is no any simulator for it, so the protocol is not secure in the malicious model. In the Lindell’s book-page 27 (the below proof), it is said that this protocol is secure!!! I am so confused. (I found a scenario where the protocol is not secure). If I understand correctly, you consider an adversary $\mathcal A$ corrupting $P_2$ in the real world, and which ignores $P_2$'s input $y$ and just outputs $0$ regardless of the value $x$ sent by $P_1$, is that right? And you claim that this adversary is not simulatable. Well, of course this adversary is simulatable: the simulator sends whatever to the trusted party, receives whatever, and outputs $0$. The proof, by the way, shows more: it shows how to construct a simulator for any adversary, as follows. 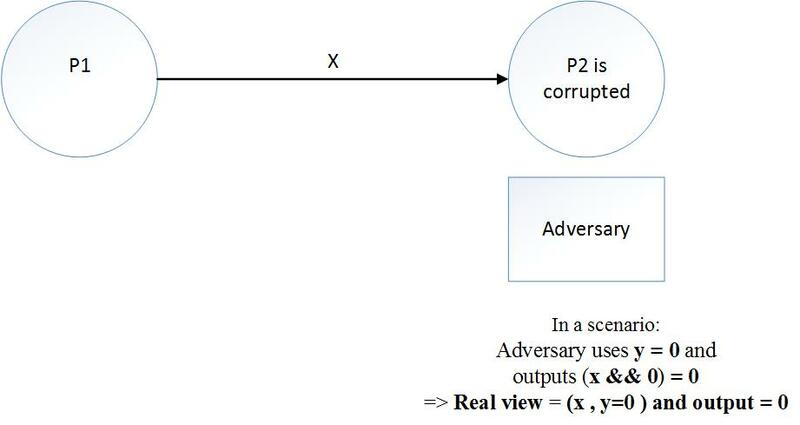 In the real world, the adversary receives $x$, performs whatever computation based on $x$, $y$, and its auxiliary output $z$, and outputs the result. 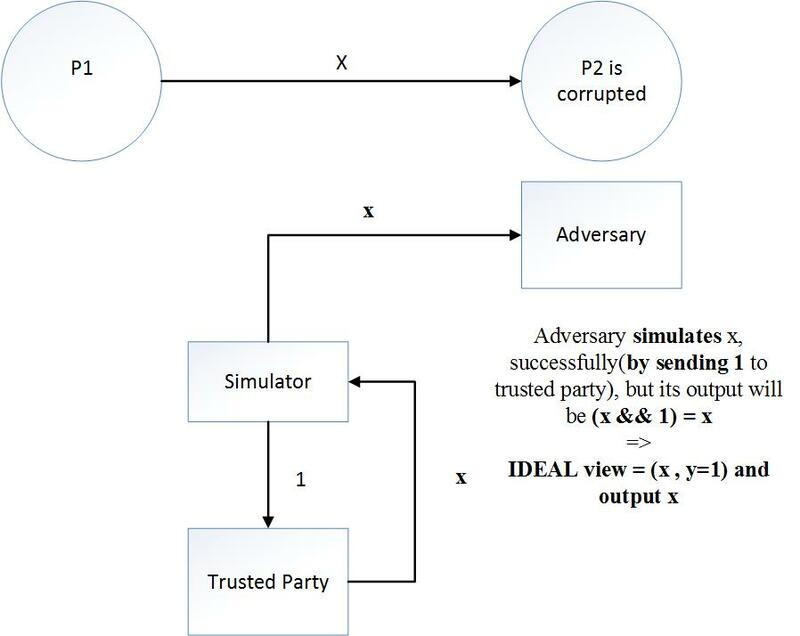 The simulator sends $1$ to the trusted party, receives $x$, performs the same computation as the real-world adversary, and outputs its result. Not the answer you're looking for? Browse other questions tagged protocol-design protocol-analysis security-definition or ask your own question. Is function Deterministic or Probabilistic in the malicious security definition? Is the simulation-based proof difficult and needed?